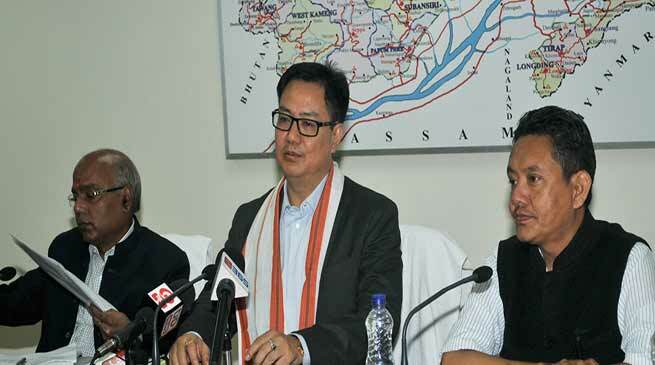 The Centre has identified 18 border villages in Arunachal Pradesh which will be developed into model ones, said Union Minister of State for Home Affairs in a press conference at Itanagar on Friday. Rijiju said that “Under the Border Area Development Programme (BADP), Singbir in West Siang and Gelling in Upper Siang would be adopted as model villages in the first phase, for which Rs 23.14 crore has been sanctioned. The remaining 16 villages have been sanctioned Rs 2 crore each. The model villages will have all the basic amenities and focus on all the priority sectors like health, water, electricity and infrastructure, the minister said. He added that funds for the model villages would be separated from the regular border area development programme that are funded annually to border areas. Arunachal Pradesh would also get a National Disaster Response Force (NDRF) battalion headquarter which would be established at Holongi near Itanagar for Rs 153 crore, Rijiju said and added that the state would also get two Indian Reserve battalions of its own. For strengthening police infrastructure in troubled Tirap, Changlang and Longding districts, a revised project with estimated cost of Rs 212.85 crore has been sanctioned by the ministry, he said.